When you or your child start fencing choosing kit can be confusing, this guide and other information on the site is to help you get the most from the sport while staying safe. Fencing by virtue of being a combat sport is potentially dangerous. Broken blades pose a particular threat and appropriate clothing and equipment, together with its proper use, is important in reducing the risk of serious injury. The requirements for fencing equipment are set out in the British Standard EN 13567:2007 and its updates. You should receive a product information sheet with all jackets, breeches and masks which conform to the standard. This provides mandatory safety and care information. Level 1 / 350 Newton / 350N This standard of protective clothing is suitable for use at clubs and national competitions. 800N plastrons are also required for all electric fencing with size 5 weapons. Level 2 / 800 Newton / 800N / FIE (Federation Internationale d’Escrime) This standard of protective clothing is suitable for the Olympic Games, World Championships and all ‘A’ grade/ World Cup events. 800N plastrons are also required for all electric fencing with size 5 weapons. The British Fencing Association has produced the following guide to what equipment is needed in what circumstances. ‘Non-electric foil blades’ does not mean dummy electric foil blades fitted with a button. To qualify for this level of clothing standard, both fencers must be using the traditional lightweight ‘steam’ foil blade as, for example, used universally before the invention of electric foil. Electric or non Electric means whether or not a weapon is suitable for fencing with electric scoring apparatus, non electric fencing is sometimes referred to as “steam”. In both cases you will need to get your chest, waist, hip, hand, head and height measurements to choose the best size from the charts on the product pages. Jacket covers the whole torso including a blade catcher at the neck line. Jackets must be brought as specifically left or right handed for front zip items. 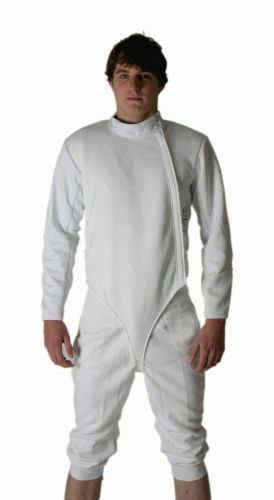 Back zip items can be used by all fencers and are therefore often purchased by clubs, but a front zip is more convenient. Plastron this is a one armed garment worn under your jacket on your sword arm and gives extra protection to the most commonly hit part of your body including the armpit, and part of the chest. This must therefore be brought as left or right handed. For non-electric fencing a 350N plastron is ok, however a 800N plastron will allow you to fence electric as it is mandatory for all adult electric fencing (see above). Breeches this is the name given to the short trousers worn to just below the knee. Due to the protective material covering over the zip fastening they must be brought for left or right handed fencing. Masks protective item covering the face and sides of the head and incorporate a bib of protective material over the front of the neck. They include a back strap to keep them in place. Masks are weapon specific. Gloves worn only on the weapon hand for protection, any of our fencing gloves are acceptable for club and national competition use. Foil and epee gloves are the same. Sabre gloves incorporate a conductive cuff. Bodywire for electric fencing a bodywire is placed underneath the fencer’s clothing and attached to the connector in the weapons guard, then to a wire leading to the scoring box. The scoring box signals with lights (one for each fencer) each time a hit is recorded. Foil and sabre wires are the same using a 2-pin connector, while epee bodywires use a 3-pin connection. Lame (pronounced La-may) this is the conductive over jacket that is used for electric scoring in both foil and sabre. They must be brought as either left or right handed – also available in back zip. Not needed for non-electric fencing or epee. Fencing Shoes as you advance in the sport specific fencing footwear will give you better grip where you need it. However any smooth soled sports footwear will be fine for getting started. Kit bags once you have all that you will need a bag to keep it all in, and soon spare weapons, drinks, towels etc.